Katharina: For one, I chose New Zealand because it’s one of the farthest countries from Germany and I wanted to be far away from it all back home for those six months. In addition to that, it’s a rather small country, so it was easy to explore in the time we had. Its beautiful and diverse landscape was another huge factor in the process of deciding where to go. It just has everything: mountains, turquoise water, white beaches, volcanoes, glaciers and endless green hills. Katharina: A friend of ours actually recommended us to. He told us about the good experience he had, so we had a look at your website, and eventually chose to book some help for our trip as well. I personally liked that it was just a starter package, so we still had a certain freedom and were able to shape our own journey and what we would like to do at which time. Katharina: I had a really positive first impression. They were very friendly and organised. They helped us with a lot! Although we’ve had several “Skype-meetings” while my friend and I were planning the whole thing, we also met up in person when we were already in Auckland. They took us to the bank to get our bank accounts and the IRD number and gave us a lot of helpful information on how to easily get a job and so on. You also took a 12-month, how was it? Katharina: Yes, we purchased a 12-month bus pass before we arrived in New Zealand. This was also recommended by a friend who did the same while he was here. We did have a lot of fun during the times we were travelling with them. We met some amazing people and had a good time in general. I liked that you were able to get off the bus whenever you felt like staying at one place longer and could hop on again a couple of days afterwards to continue your travels. In addition to that, the bus drivers were very nice and cool people with a lot of background knowledge on the country and the activities you could do. Even though we had a great time with this bus company, retrospectively, we’d have preferred buying a car, simply because you have a lot more freedom in terms of where you want to go and how long you can stay at a place. Katharina: I would describe it as a really good thing for backpackers or travellers in general who would like to have some help with the organisational things that come along with a longer trip, like applying for a visa, getting an IRD number and so on, while still having the freedom of shaping their trip to their likings. 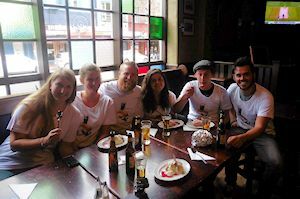 Katharina: I think the best thing they did for us was supporting us throughout our whole trip. They texted us once in a while to see how we were doing and if everything was going well. They also would book us a ferry or a bus if we asked him to. I really liked this continuous support, and that it didn’t stop after those first days in Auckland after helping us with the basic stuff. Katharina: That’s really difficult to say. I’ve done so many great things. 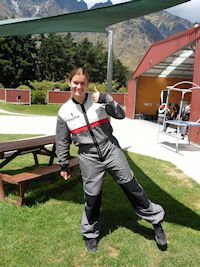 I’d say the Skydive in Queenstown was pretty cool to see the whole town, lake and the Remarkables from above, even though it was over way too soon. Other than that, the whole trip, meeting new people, seeing New Zealand was amazing. 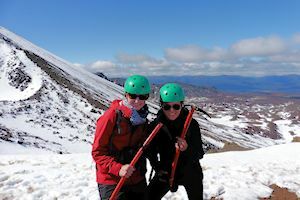 Katharina: I think one of the biggest challenges actually was to get along with my friend and to agree with her on how to spend our time there in New Zealand. Not that I didn’t like doing this trip with her, it’s just that it is always difficult to travel with someone for such a long time and, of course, it happened that we would argue over little things. But I am glad that we did this together and that we shared this experience. It also helped us get to know each other better, to be honest with each other, and to talk about things that bothered us instead of keeping silent. Katharina: My advice would be to not plan everything in advance, because your plans will change so many times, especially when you are actually in the country. Also, don’t try to squeeze in too many things you want to see or do when you actually don’t have that much time. Instead, enjoy fewer places and prioritise. Other than that, I can just say: enjoy this beautiful country, stay in touch with the amazing people you’ll meet there, and the end will come sooner than you think. Katharina: I became a lot more independent, improved my English, and also know myself and my goals in life better after those six months of travelling. I also made lots of new friends from all over the world, whom I hope to visit soon. In addition to that, I learned that travelling will be a constant and important part for the rest of my life and that my bucket list, in terms of countries I would like to visit in the future, has expanded a lot. What is your favorite spot in New Zealand so far? Katharina: That is very hard to say, because this whole country is so different and you can’t really compare its places with one another. I’d say one of my favorite places there is Queenstown. Not only did we celebrate both my 21st Birthday and New Year’s Eve there and also met lots of great friends there, but also because it’s very diverse. Of course you can go out partying every night, eat lots of Fergburgers (which I totally recommend), but you also have the opportunity to do a lot of different hikes on the surrounding mountains, to go skiing in winter, or to just relax on the beach by the beautiful lake. Apart from Queenstown, I really liked the Coromandel region, especially Hahei, with its amazing beaches and great climate. Katharina travelled through New Zealand with Anna.